The Department of Children, Youth, and Families has big goals. We want to make life better for all families, not just those we serve. We want to take a new approach to contracting that will support providers throughout the state to make an even bigger impact for families and communities. We recognize the systemic inequities that lead to fewer opportunities for children of color to succeed – and we want to address this. But … how? How do we take action, day in and day out, to help us turn our vision – that all Washington’s children and youth grow up safe and healthy – into reality? How do we know if what we’re doing is making a difference? Simply put, we want to know where we are not meeting our goals to support children, youth, and families, and what investments and improvements we’re going to make to change that. 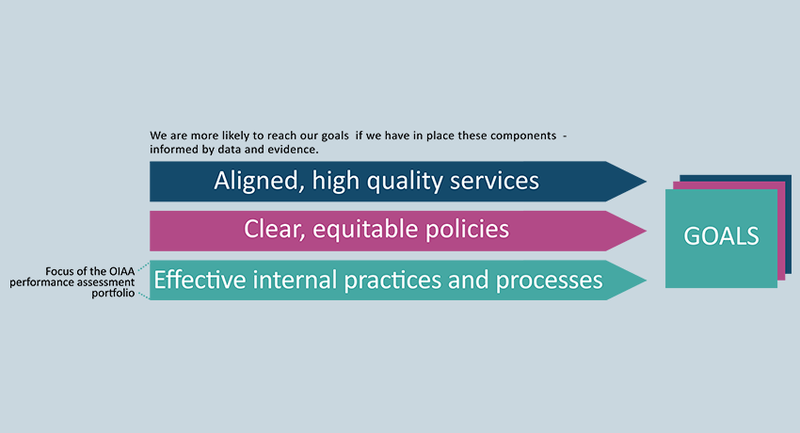 There are three core components to assessing our performance that the Office of Innovation, Alignment and Accountability is working on over the next year. We are taking a comprehensive look at where we stand now. This is our baseline performance assessment. Across the areas of child welfare, early learning and juvenile justice, we are wading through years of reports, policy manuals, process maps, and data dashboards. We’re learning from staff about how they collect, manage, and report data about their work, and how they use data to make decisions. The goal is to weave together a story about not only how we’re doing on the measures we’re monitoring, but how we know how we’re doing on those measures, and how these measures are connected ultimately to child outcomes. We are examining our use and management of data; we won’t be able to make improvements if we can’t assess how we’re doing. There are many actions that our agency can, and does, take. But, assuming that we can’t do everything at once, how do we prioritize? We need to know which processes and practices that we follow are the most impactful for children, youth and families. That’s why we’re using data and evidence, including the lived experiences of staff and clients, to identify the ways we should do business to get the best outcomes. We already know that we want to see improvements in the health, education and resilience among our clients and our state’s families, but we also need complementary outcome goals for our agency. Once we have our specific child outcome goals and measures in place, we will be able to identify what has to be true for DCYF so that it can be best equipped to support children, youth and families. We’ll be choosing priority measures that help us track how we’re doing on those actions across the new agency, and over the course of months and years, we will monitor our progress so that we can make adjustments and improvements that help us support children, youth, and families to thrive. This is a big job, and we’re calling on experts in this kind of system-level transformation to help us. The Office of Innovation is working with Chapin Hall at the University of Chicago, a well-known policy research institute, to do in-depth analysis of how we measure our performance and to provide recommendations for goals and measures based on our agency priorities, as well as research and national best practices. They specialize in turning data into action, which is exactly what we’re going for. We’re also bringing in the expertise of many stakeholders – internal and external to the agency. We’re talking to staff and asking them about the ways that they track successes and failures, and the ways that they use data about their work to make improvements that change the game for children, youth and families. We’re asking stakeholders – youth, parents, advocates, professionals – how they experience their interactions with us and what agency processes or policies make a difference for them. Following the baseline assessment and stakeholder feedback, OIAA will work on rolling out new priority performance metrics internally for our leaders to use as well as externally to maintain accountability to the public. We want to hear from you, too! If you have comments or questions about agency performance assessment, email us at OIAA@dcyf.wa.gov.